At A.J. Dell’Omo, Inc., Realtors, our pets are like family, so we want to provide extra special care this Holiday Season to keep them safe and happy. Here are a few safety tips you’ll want to share with your pet-loving friends. Many seasonal plants are poisonous to your four-legged family member, including Poinsettias, Holly and yew branches or greenery you might use in your Holiday inspired floral arrangement or centerpiece. Fido and Fluffy are going to be curious about the decorations around the house and gifts under the tree. These ornamental accents can be dangerous. If swallowed, tinsel and gift bows can cause serious intestinal blockage. Pets may also like to chew on strands of holiday lights and extension cords. Create barriers and keep these items out-of-reach from your curious critter. As guests come in and out of your home, it’s easy for your pet to sneak out unnoticed. Be sure they are microchipped and wearing a collar with an informational tag. You can also temporarily keep your pet in a closed room or crate until all the guests arrive. Lastly, it is tempting for you and your dinner guests to feed your pet dinner scraps and leftovers. However, many of our Holiday ingredients can make your pet sick, including chocolate, eggnog, yeast, pork meat, garlic, onions, grapes and raisins. The A.J. 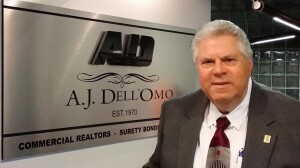 Dell’Omo, Inc., Realtors Team would like to wish you and your loved ones a happy and safe Holiday Season.